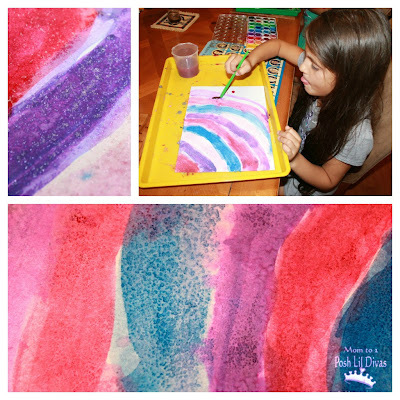 After seeing this cool watercolor exploration by The Chocolate Muffin Tree, I knew it was something the Lil Divas would enjoy. I had planned to do it this summer but we never got around to it. 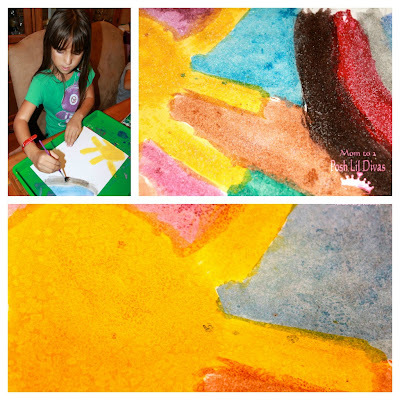 Last week, we finally sat down to enjoy some painting at the Lil Divas request and I immediately brought out the table salt as well, hoping their curiosity would be piqued enough to give it a try. They were instantly interested in seeing what would happen and I must say, the results were pretty cool. 1. 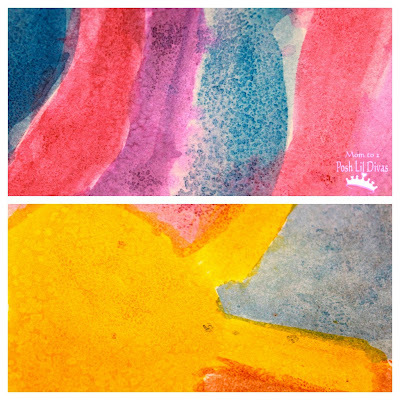 Use your water color to paint a picture. 2. Freely sprinkle salt onto your picture. 3. I allowed the painting to dry and then tapped off the excess salt. Since the Lil Divas wanted to hang their pictures I used a napkin to gently wipe off the leftover salt. That's it. 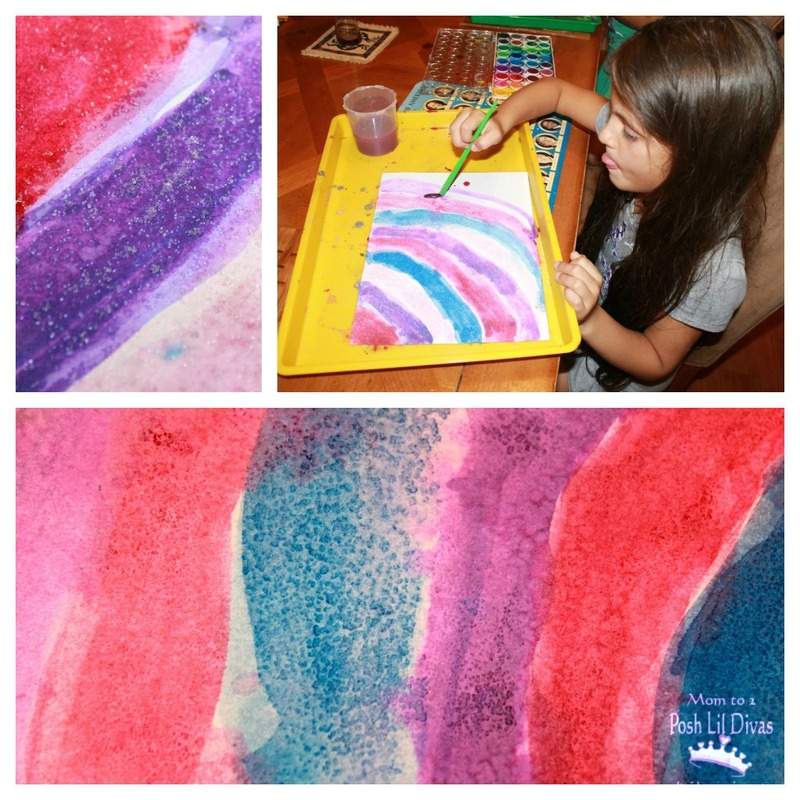 A super simple art activity with awesome visual results. The salt gives the painting a unique look of texture compared to simply using watercolors alone. It makes parts of the painting lighter than others and leaves some neat prints behind. This is definitely an activity we will be revisiting again. Have you tried sprinkling salt to your watercolor paintings? What did you think of the effect it gave the artwork? If you've never tried it before, do you think it's something you or your child would enjoy? Be sure to let me know if you have given or will give it a try. I'd love to see your masterpiece(s). 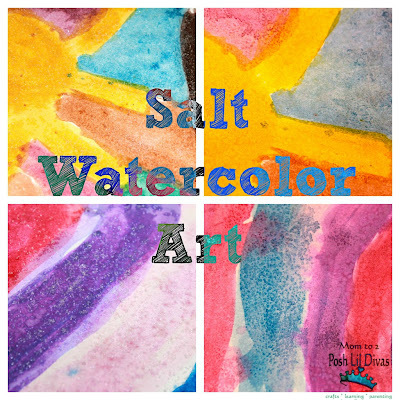 We haven't tried this yet, but I may throw it in as an art activity with our FIAR row this week! Thanks for sharing. Eddie, it was fun and the girls have already asked to do it again - sure sign of a fun activity. Would love to share this post with my readers! Would it be ok to link to you in one of my feature articles? You can check out my website at the link above. I'm going to check out your Pinterest page and be sharing that with my readers, too! Thank you for your creative ideas! Thanks for sharing Marie and for visiting us. Wonderful. what a great way to explore colour and art! you could also spraying water onto the art work while it's damp. It gives interesting results too. And how about using a tooth brush loaded with paint?!! Guys, you might like this blog post about the longest word in English. Check it out!